MANILA -- President Rodrigo R. Duterte on Wednesday said he was unsure if peace talks with the Communist Party of the Philippines-New People's Army (CPP-NPA) would resume any time soon, admitting that he was “not ready” to talk to them yet. He lambasted the NPA for “destroying the government” and killing soldiers, policemen, and civilians since they were established over 50 years ago. The President, meanwhile, said that he has tried mending their relationship by allowing communists to work in government. 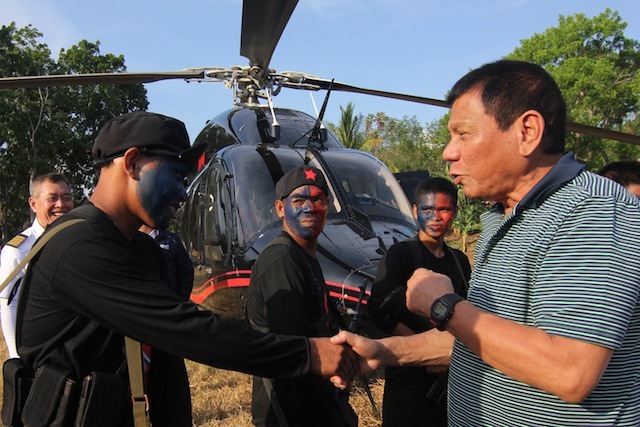 “In my desire really to just extend a helping hand maybe I can succeed talking to them, naipasok ko rin sa gobyerno (I allowed them in my Cabinet),” Duterte said. He, however, said he was relieved that Congress rejected their appointments. “Mabuti na lang ni-reject ng Congress ‘yung appointments nila. It turned out to be na ayaw talaga nila ng --- (It’s good the Congress rejected their appointments. It turned out to they really didn't like) even the talks now are almost done,” Duterte said. Duterte earlier appointed leftist leaders Judy Taguiwalo as Social Welfare Secretary and Rafael Mariano as Agrarian Reform Secretary but their appointments were rejected by the Commission on Appointments last year. Earlier, Duterte claimed that communists, Magdalo Group, and other members of the opposition are conspiring to remove him from his post. Defense Secretary Delfin Lorenzana added that the reported "Red October" ouster plot is confirmed to be the handiwork of the CPP-NPA and that military is taking it seriously. According to Lorenzana, the with the cancellation of the peace talks, the implementation of the proposed ouster plot became more urgent for the rebels.